Traveling during the world’s largest annual migration is not for the weak-spirited or inexperienced. Here’s the best advice about traveling in China during the Spring Festival: don’t. Even for many locals, the fireworks and festivities aren’t worth the higher prices and the headaches of milling crowds. But for anyone willing to overcome snags in exchange for a grand spectacle, here are nine tips for preparing for the ultimate travel challenge. Bring only the most essentials — you will thank us later. Weather everywhere, except for south China, is frigid this time of year, so make sure you prioritize wool sweaters, down coats, fur-lined shoes, thermals and warm accessories in the one-checked-bag allowed on domestic flights and trains. The weight limit is 20 kilos for checked bags, but considering the increase in crowds and pickpockets during this time, the lighter and less valuable your luggage, the better. 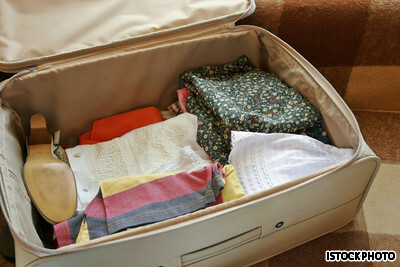 Normally everything, especially cheap clothes, can be bought easily in China. Small shops and market stalls will close on the eve and the first three days of Lunar New Year (January 22-25), and gradually open in the days ahead. Not a bad stunt to practice for your China trip. Booking air travel, hotels and restaurants is a must. Planning ahead for trains is limited, however, as tickets don’t go on sale at train stations, agent booths or online until 12 days in advance of departure. Even travel agencies that charge two or three times the ticket price offer no guarantees. Before the Lunar New Year, tickets to smaller towns from big cities, especially Guangzhou, the “factory of the world,” are hardest to find. Move in the opposite direction of the migration and take advantage of the travel lull on the first couple of days after the New Year, when most Chinese will still be at home with families. Crowds are also thinner between big cities on newer D and Z express trains as they do not stop at smaller stations and are more expensive. But even these tickets should be bought as soon as they become available. Usually that means lining up at train stations hours before midnight. Don’t let the crowds fool you into thinking departure times will be lax either. Trains close their gates five minutes early and often earlier during Chunyun. A taxi ride to the station that normally takes 30 minutes can easily last two hours and a 60-meter walk to your gate, 30 minutes. Travelers are required to show valid IDs while buying tickets and boarding the train. 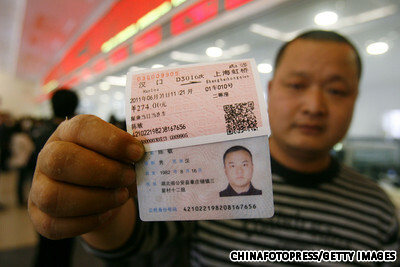 Every train ticket in China must have a matching valid ID that each passenger shows both when buying tickets and boarding trains. This is the first year people can buy tickets online at www.12306.cn, the customer service site run by China Railway Bureau. While it could be considered a viable alternative to standing in long lines at train stations or agent offices, news sources have reported that online booking has experienced glitches. The online site also is only in Chinese and only accepts payment from an online China account. Only Chinese citizens can book by telephone (+86 12306). Just imagine what it will be like when they finally get on the train. 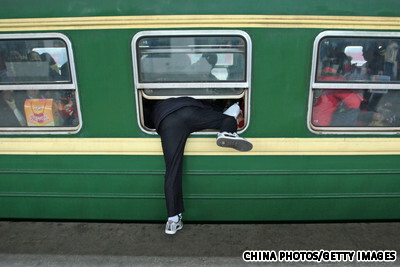 Never buy a standing train ticket around the Spring Festival. The only exception is if the trip is less than four hours and during daylight hours. Trains that sell standing tickets are bad enough for people in seats, who must bear stuffy rides with strangers’ backsides in their faces. But anyone left standing undergoes a form of mental torture. It is socially acceptable for the elderly and children to sleep on newspapers under a row of seats. Young people sometimes bend their bodies around baggage on racks above. Foreigners and the inexperienced, however, usually end up next to the bathrooms, jumping up regularly from their newspaper plots to let people pass. Here, cigarette smoke mixes with the smell of ammonia, body odor and clogged toilets. A common scene (and sound) in China during the Spring Festival. The real mark of the festival comes at night when fireworks can be set off by anyone with a match. Traditionally fireworks were meant to ward off evil spirits, but now it seems to be a way to show off one’s disposable income. Some corner of China’s night sky will be lit up by fireworks every night for about two weeks, but three nights in particular won’t let anyone sleep. The fireworks build up to a crescendo on Lunar New Years’ Eve at midnight and again at dawn the following day. 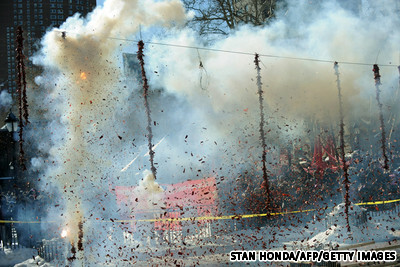 The second blast comes on the fifth day of the New Year, when people set off fireworks to ensure wealth in their future, and then finally on the Lantern Festival. 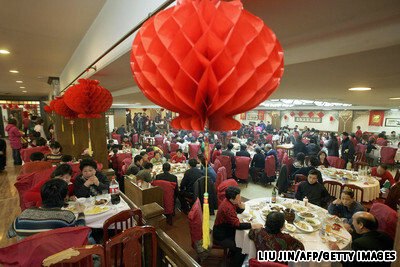 Most restaurants are either shut or chockablock for the first few days of Lunar New Year. Most small restaurants in China will be shut at least between the Lunar New Year’s Eve and the third day of the festival, so should make sure you have adequate reserves of toasted bread and cold cuts for the whole period. Opening hours of supermarkets will be shortened too. Many upscale restaurants will stay open, but most tables were reserved by local families as early as six months ago, as more than more Chinese choose to dine out through the Spring Festival. These few restaurants in Shanghai provide undisrupted service with no added service charge: Guyi on Fumin Lu, South Beauty on Taojiang Lu, Lost Heaven on Gaoyou Lu and Din Tai Fung on Nanjing Xi Lu. But make sure to call and confirm they have extra seats before heading over. Cheaper options are Muslim hand-pulled noodle restaurants around the city, which do not celebrate Lunar New Year and will be open during the festivities. Recommended is the Lanzhou Hand-pulled Noodles on Anfu Lu. For guests staying at big hotels, take advantage of the hotel restaurants as most of them will operate non-stop throughout the holiday. Touring the Bund will be less of a pushy job during the Spring Festival. 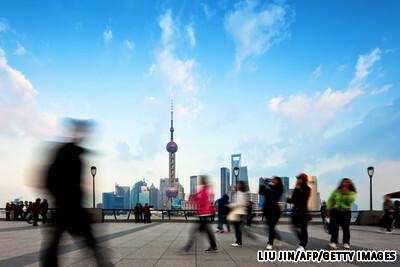 Since the locals will be spending time in their homes and out-of-city hometowns, the Spring Festival presents a good opportunity to tour big Chinese cities like Shanghai — roads will be less trafficked and main spots in the city center less crowded. Seize the opportunity to visit normally crammed attractions, such as Shanghai Museum (which will maintain normal opening times of 9 a.m.-4 p.m. during the whole festival), the Yu Garden and the Bund. Finding a taxi will be a painful endeavor, especially on the night of January 22; so travel on the subway or rent bicycles from the public rental service. A special bike card is required for renting public bicycles in Shanghai. The card can be obtained at the following two venues with your ID/passport, plus a RMB 300 registration fee. 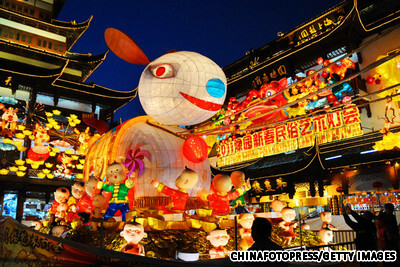 Shanghai Yu Garden is the ground zero to celebrate the Lantern Festival with the annual lantern fair. Even though most migrant workers will be going back to their hometowns and local Shanghainese will be locked inside their homes celebrating with their families, do not expect Shanghai city center to be a miserable dark desert at night. For the whole public holiday period (January 22-27), all scenic lights will be turned on until midnight, so take a stroll in Lujiazui or along the Bund and Huaihai Zhong Lu to enjoy the festive red lanterns. Besides, all major hotels in the city are organizing banquets and cocktail parties for the night of January 22 starting at RMB 538 at The Westin Bund Center, Shanghai. As a last resort, local favorite No.88 Bar on Fumin Lu will be open non-stop throughout the holiday for a cup of good cheer (in the form of its quintessential drink, a mix of whiskey and green tea). 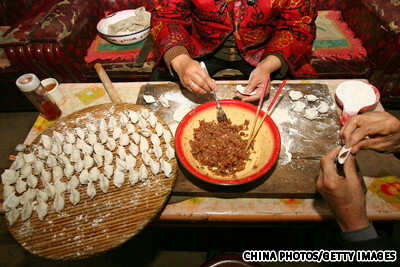 The best China travel experience: dining with a local family on Lunar New Year’s Eve. But of course, no tourist tour could beat the experience of spending Lunar New Year with a local family. Find a Chinese partner in the days before the Lunar New Year’s Eve, so that you have a chance to be introduced to the folks then and there during the Spring Festival. Visit the “marriage market” in People’s Square on January 21, where hundreds of parents exchange profiles of their kids to try to find the right match. Alternatively, sign up for a Chinese dating website. According to Gong Haiyan, CEO of China’s major dating site Shiji Jiayuan, one will be able to choose among 30 million registered love-seeking users. Naturally, cross-cultural relationships entail compromise and mutual understanding. However, couples will be rewarded with a totally authentic night of dumpling-wrapping, firework-throwing and Chinese spirit-sipping on Lunar New Year’s Eve.